> Today we have a rather festive dress for the dressgasm that looks like a candy cane to me. The search for Christmasy dresses was turning up very little results in my look at Google. I believe that’s because most people could not afford to have a dress made just for one holiday out of the year, so they simply wore their best church dresses. I found this dress from the Victoria and Albert Museum in England, as I recall. The listing said the dress was made of damask, a type of silk, and I found that odd because damask was typically used for upholstery and linens in my understanding of the types of silk. It was a wedding dress as opposed to a holiday dress. At the time, white wedding dresses were not the requirement that they are today so a woman typically wore, again, her best church dress and reused it. 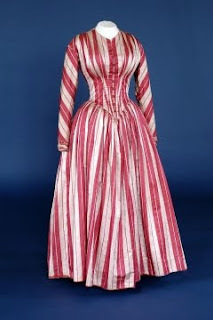 I am, however, surprised that this dress was worn by a bride when it has red stripes because red was the color of a woman who wanted attention. Some believed red was the color of a harlot or a flashy woman, both which were very undesirable qualities, especially for a bride. It’s possible that it was for a second wedding but even then, I have never seen evidence of another bride from that period wearing red. This dress is from 1849. The best way to date 1840s dresses as opposed to 1860s dresses is to look at the characteristics of the waistline, the shape of the skirt and the shape of the bodice. Waistlines of the 1840s were almost always pointed and at or slightly below the natural waistline, and as the 1850s progressed, the waistline rose higher and higher. By the 1860s, the waistline was about two inches above the natural level. The cage crinoline was not used until the 1850s so the skirts of the 1840s tended to be narrower with only petticoats to fill their width. The bodice of the 1840s was extremely tight and fanned upward in a decidedly V-shape as well.